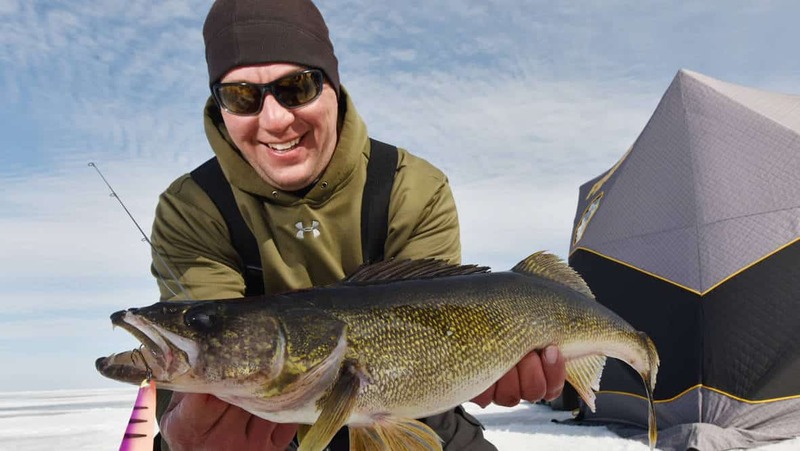 Walleyes are the most sought-after species on Lake of the Woods. 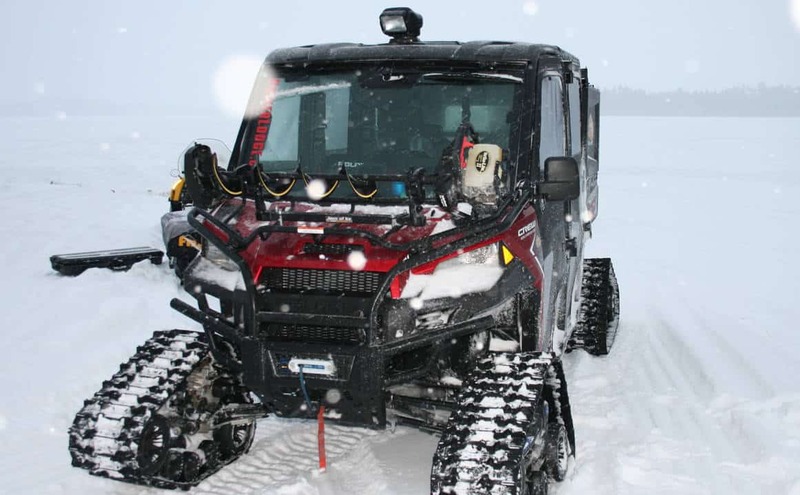 You’ll need a snowmobile or some other ‘smaller’ vehicle to explore remote sections. The Canadian wilderness becomes a true “wilderness” once temperatures drop and the ice forms. Many resort owners pack their bags and head to Florida or hit the All Canada Show circuit. 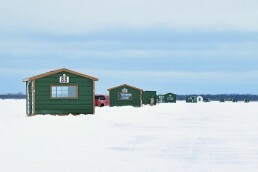 But some hardy souls keep their resort open year ‘round to brave the winter and welcome ice fishermen to a true experience. This is no place for amateurs; trouble can arrive in an instant. There is ice on a deserted road, a vehicle can get stuck on the ice or a current area can have unsafe ice. 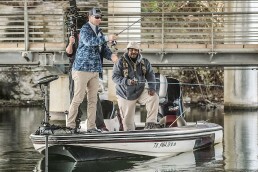 You want to be as prepared as possible with the right gear and safety equipment just as much as you want to have the right tackle and techniques. 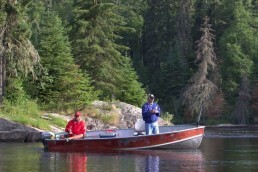 While many resorts provide plowed roads and permanent shacks, the real good fishing is usually off the beaten path. Some might just be a few steps away, but many ideal spots can be a few miles away. And, a lot of times that permanent shack was on a hot spot days ago and then you find out that the fish have moved. If the weather is right, it’s time to explore by heading to shallower water and drilling holes as you go. 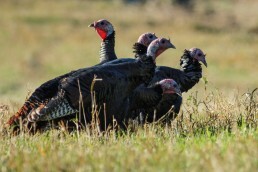 An aggressive search means dropping lures in each hole. And once a fish is located, you can drill a few more in the area and hunker down. Heading off the plowed roads into other locations in your truck is not advisable. Lake of the Woods is big water with current areas and soft spots covered by snow with drifts that can stop you in a hurry. I’d recommend a snowmobile, and not an ATV. And, bring along a buddy that has one too. A dependable snowmobile is a needed for the adventure, and a portable shelter that can handle a rough ride is ideal. Also, a good gas auger with an extension is also a must. 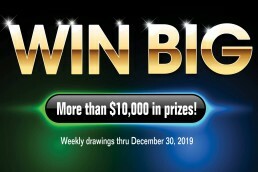 Bring safety gear, including a heavy 53-inch ice chisel to test the ice and have creepers to prevent slippage. 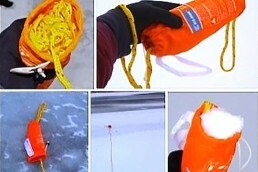 Frabill makes an I-Flote floatation suit too with a spot for ice picks built right in the jacket. GPS with a map chip is sometimes necessary. Many maps of Lake of the Woods aren’t detailed enough so enterprising anglers map their own spots in the open-water season using software. Even if you have a reliable map you still need a guide for a day or two. 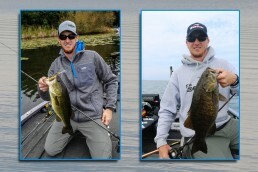 Most resorts open all year have a few guides on staff and it’s definitely worth it to get the lay of the land, the depths to fish and the right spots on the first day of your trip. 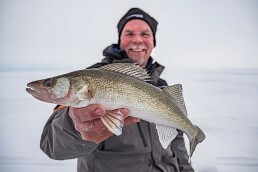 You’ll need heavier tackle in Canada than you would on local ice trips. 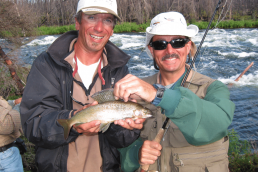 Fish are more aggressive here because they are less pressured and there are more of them. 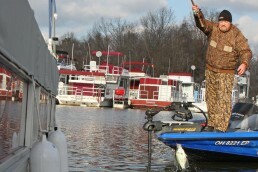 You’ll need heavier jigs, too. 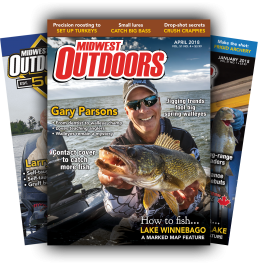 Our favorite lures are jigging spoons, balance minnows, tungsten jigs and walleye jigs used in open water. 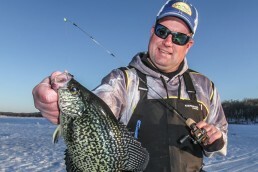 Crappies are a major target species on LOW. They are prolific and easy to locate, especially once the ice is thick enough to drive on. Look for deep holes off of points and deep shorelines. We like areas 15 to 40 feet deep, and once you find the right depth it’s pretty easy to find similar spots on a map. 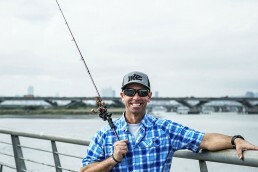 If you don’t catch fish in a new area in 15 minutes, make a move. 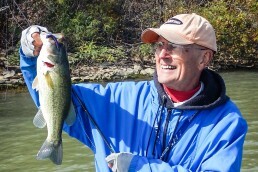 We have had the most success with Demon Jigging Spoons, RPM Minnow size 3s and 5/16-ounce Slender Spoons. 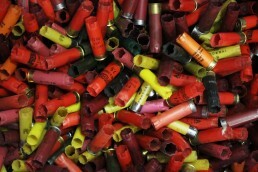 Make sure to bring waxworms, spikes and dead minnows too because you never know what will work best. Lake trout are the “glamour species,” and a ton of fun to catch. 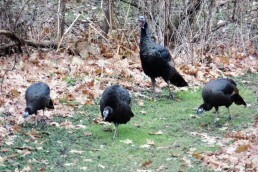 They’re available in certain areas of LOW and nearby Crow Lake in Nester Falls. When you think lake trout, think deep. We have fished them in as shallow as 30 feet, but normally it’s between 60 and 90 feet. 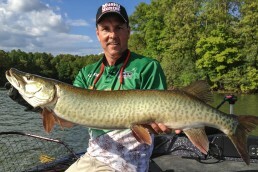 You’ll need to have a large-spool reel with thin-diameter braid and a stiff rod to take on these fish. 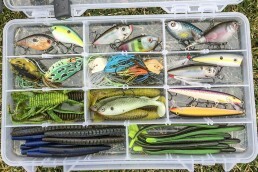 Our top-producing lures were RPM5 Minnows and B-Fish-N Tackle’s 1/2- and 5/8-ounce H20 Jigs with AuthentX Moxi plastic. We have been experimenting with BFNT Glitter Jigs and Tinsel, which are a must-have for trout fishermen. 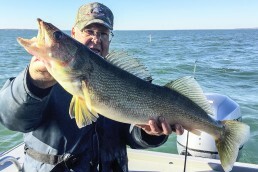 Reefs and humps are top walleye spots. Anglers will drill holes up and down the reef and focus on the edges. 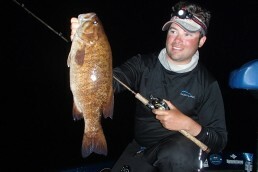 Fish will move shallower in low light or darkness and will move deeper during the heat of the day. Perch inhabit these same areas, usually a few inches to a few feet off the bottom. Perch are a good sign since they are food for walleyes. 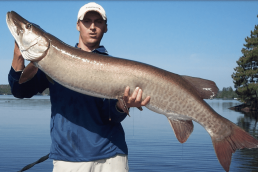 If they become too persistent, switch to a larger lure and use minnows or spoons. 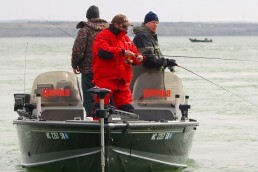 Fishing action is hot right now, so why wait until spring or summer for that Canadian adventure? Head north—today.